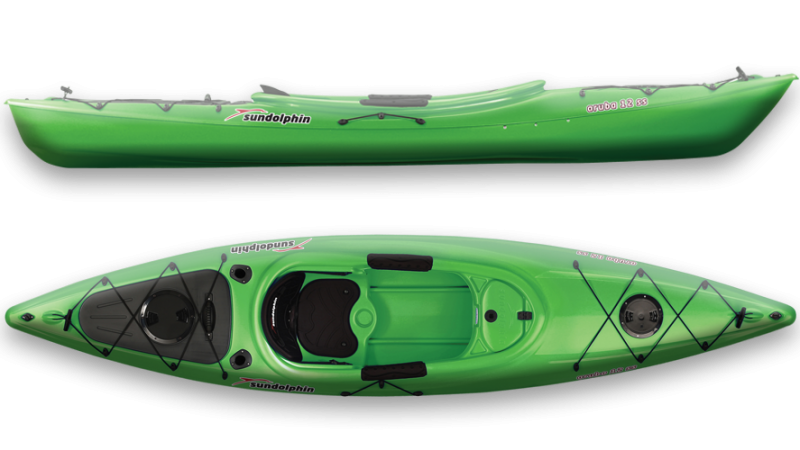 Sun Dolphin has a number of fishing kayaks, but their Aruba 12 SS which is aimed at the recreational market, also makes for a nice versatile option. You may have to make a couple of modifications if you want to engage in serious angling, but for the price you get plenty of value for money here. The Aruba 12 SS is 12' long, 21 /12" wide and weighs 47 lbs. There are shorter models of the Aruba available, but these have less space and a lower carrying capacity than the 395 lbs that the 12 SS offers. While the Aruba 12 SS isn't the most lightweight of kayaks, it is considerably lighter than some of the serious fishing kayaks and manageable enough. It also has retractable carrying handles to make it easier to transport. It was designed for lakes and givers, so the tracking is pretty good and it is fairly easy to paddle. The Aruba 12 SS also offers enough stability to make it suitable for angling. Some owners of the Aruba 12 SS have reported that it can be challenging to maneuver in windy conditions, which is something to keep in mind. It is definitely a kayak that performs best in conditions that are relatively calm. In terms of features, the Aruba 12 SS offers a surprising amount considering its budget minded price. It comes with a portable accessory carrier that can be used as extra storage, a storage compartment, paddle holder and shock cord deck rigging. In front of the seating area you'll also find a covered console and two flush mount rod holders behind the seat. Speaking of the seat, the seating area itself is quite large, but the seat itself can become uncomfortable after a few hours. Luckily, the kayak also has adjustable foot braces as well as protective thigh pads to help you out. There are obviously fishing kayaks available that are more durable or with more features, but overall the Aruba 12 SS is not a bad choice if you have a very limited budget.